Anyway, this is the end of Beatles Week. I’ve had several ideas for posts over the last few months, but none of them fit Beatles Week, so I didn’t do them and now they’re gone. If I don’t call this Week finished, I may never write again. I still want to average a post a week this year before I turn 40, and I’ve only got 9 months left to do it, so I had to do something. I hope this gets me back to writing. I think I won’t do a 2011 Beatles Week. I love the idea of it and will most likely come back to it some day, but it seems silly to start one so close to the end of this one. The men’s staff restroom at work has a motion sensor-controlled light. The sensor must be optimally placed, because opening the door even slightly will turn the lights on. Once the lights are on, they turn off after about five minutes of no motion. So it’s been weird for me that since summer started and the place is mostly empty any time I’ve gone to the restroom the light has already been on. Suspicious, really. I look forward to the building emptying out during the summer, so it made me wonder what was going on. But I think I figured out yesterday what the deal was. I’m not just talking about normal little spiders here. You’ve seen The Lord of the Rings: The Return of the King? You remember Shelob? Yeah. You might think I’m exaggerating, but think with me here – would normal-sized spiders set off the motion sensors? I don’t think so. What is it about spiders that creep people out so much? I’m not one for insects in general, but spiders are way worse for me. Maybe it’s the two extra legs? I don’t know. The feeling of walking into a spiderweb isn’t helping spiders’ cases any, either. Just seeing a spider walking around causes me to tense up. If the spider happens to be doing his walking around in a place where I’m trying to live, well, I’m sorry, but that’s a spider who has decided to no longer live. If it’s doing it’s walking around outside, I do my best to let it keep wandering unhindered – this represents growth on my part, I would like to point out. My Australian friend Carolyn loves spiders, but she lives on a gigantic island full of animals who’d sooner kill you than look at you (yes, kangaroos, I’m including you in that list), so spiders probably seem tame by comparison. For most of the rest of us, though, we’d be fine not seeing any spiders for weeks at a time. Scientists have speculated that we’re never more than three feet from a spider at any given time, but scientists are apparently jerks who hate everyone, so it’s best we just ignore them on this point. You can’t keep spiders out of things, I think that’s the biggest problem with them. Doesn’t matter how many holes you fix, spiders will still get in. Everywhere. There’s no stopping them. Bug sprays might put them off for a while, but they’ll be back, and they’ll probably bring friends (though I’m not sure how spiders would have friends, as it seems spiders are so creepy that even other spiders wouldn’t want to hang out with them). Face it, you’re pretty much stuck with spiders. Yeah, yeah, I know they’re supposed to cut down on the fly and mosquito populations, but I haven’t noticed any absence of those, so spiders clearly aren’t doing their job, so not only are they super creepy, they’re apparently lazy, too. Weird thing is, I’m a big fan of Spider-Man. He’s my second-favorite superhero, but I don’t know why! It certainly seems like I’d be loathe to even pick up a comic book with him on the cover, but I guess his humor and pathos outweighs the creep-out factor. Still, there’ve been a few spider-intensive panels here and there that almost did me in. Peter getting in touch with his spidery side, that kind of thing. No, thanks! So I guess what I’m trying to say here is, spiders, if you’re reading this (with you freaky eight little beady eyes), can we just make some sort of deal where you’re not in rooms I’m in, especially when those rooms are restrooms? Please? In return, I promise to… hmm. Kill your friends more quickly and painlessly? That’s the best I can offer. Song Info (from Beatlesongs):”Piggies” is on the White Album, and was 85% written by George Harrison, 10% by John Lennon, and 5% by George’s mom. This song is most famous for Charles Manson’s interpretation of it as a description of the people who would be the victims in the revolution/war he believed was imminent. Bummer, that. Twenty-one years ago today, the world lost a great and unique talent. Jim Henson wasn’t just the voice of several of The Muppets, he, in many ways, was The Muppets. His love for storytelling and puppetry combined in ways no one had seen before. He had guest appearances on The Ed Sullivan Show and created many shorts, commercials, and movies. The success of Sesame Street led to The Muppet Show and a whole bunch of other stuff (wiki). I was a few weeks shy of graduating from high school when he died. I honestly don’t remember the specifics of how I felt then, though I know it was shocking. Over time it seems to have affected me more and more. I didn’t see his memorial service as it happened, but usually take the time to watch part of it every year on this day. If you have any connections to or feelings for The Muppets and Jim Henson, this video of a song from his memorial service will affect you deeply. 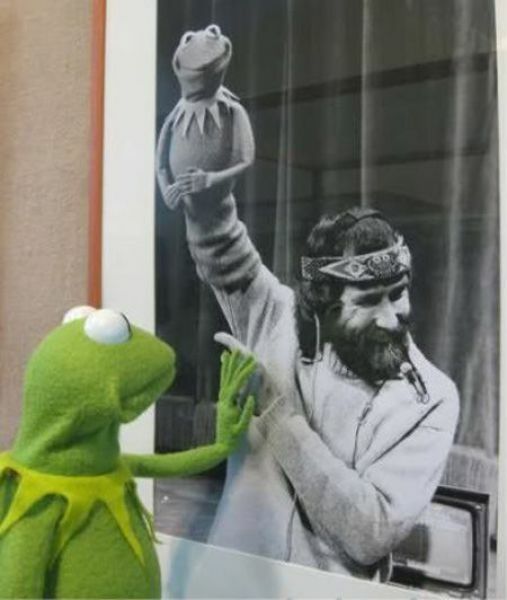 There are few celebrity deaths that affect me much, but if I’d ever had the chance to meet Jim Henson, I would have thanked him for all the smiles and songs and silly creatures.